It has a digital display which allows different system information to be shown. The solar charge controllers Steca Solarix 2401 are optimally suited for inverter systems. Inverters have to be connected directly to the battery. The Steca Solarix 2401 combine basic solar charger functions with a 40 A high-performance charge controller. It is available as 12 V / 24 V system. This makes the solar charge controller very cost effective. The load current is limited to 10 A. The charging processes are based on the voltage level, which can be individually set with the help of four buttons behind the front casing. 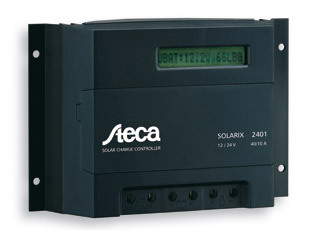 More about Solar Controller Steca Solarix 2401 - 12/24V, 40/10A w. LCD.